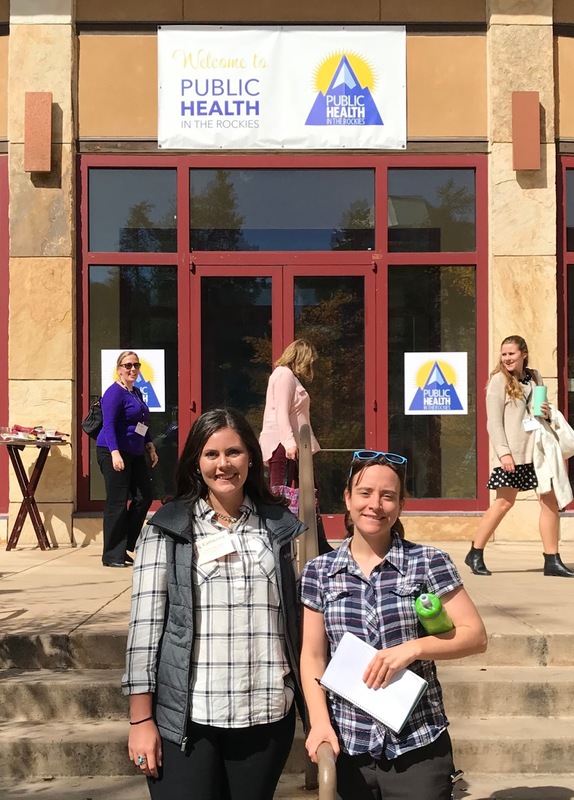 Health Promotion Specialists Katie Smith, left, and Kelsey Fife presented "Activating Spaces: an inclusive and data-driven approach to outdoor recreation" at the Public Health in the Rockies conference in Keystone, last week. Activating Spaces was a Colorado Health Foundation funded project that Mesa County Public Health implemented, bringing outdoor improvements to five local elementary schools. Child Care Licensing Specialist Audrey Osgood, left, Mesa County Public Health Executive Director Jeff Kuhr and Nurse-Family Partnership Nurse Amber Ladd smile for the camera on October 2. 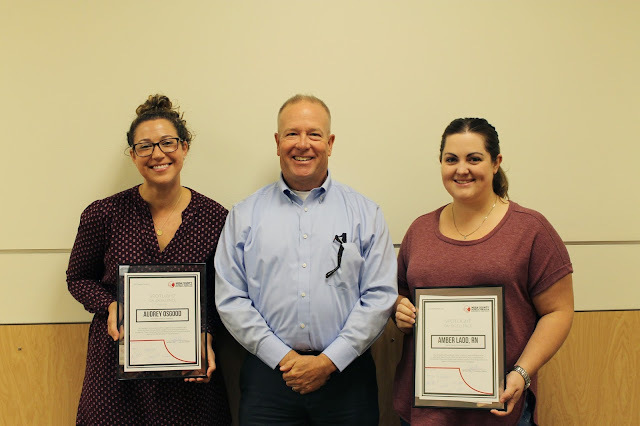 Audrey and Amber were the first recipients of the Mesa County Public Health Spotlight on Excellence Award. The award shines a light on team members who exemplify Mesa County Public Health's Vision and Commitment to Excellence. These individuals have modeled professional, productive and agency-minded behavior in the workplace. Way to go, Audrey and Amber! We are lucky to have you at MCPH! 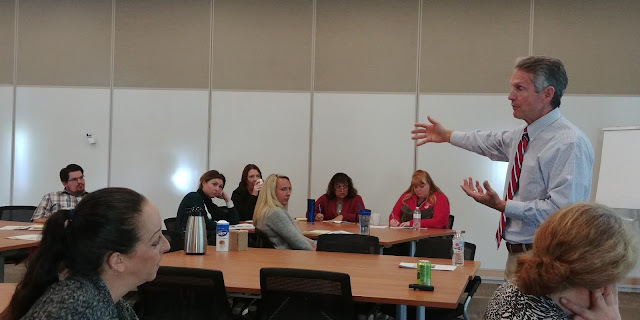 Mesa County Department of Human Services and Workforce Center staff members participate in a "7 Habits of Highly Effective People" training with Jeff Carney from the Franklin Covey Company. 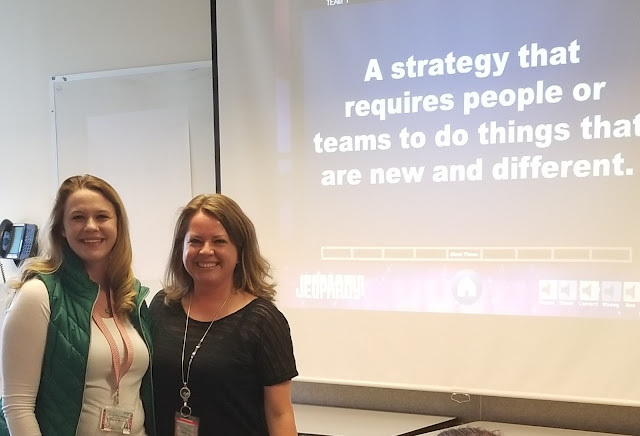 From left to right: Becca Chase, Susan Skyberg, Amy Joy, Dalys Otberg Matt Furphy, Larua Kinson intently listen to the afternoon session of the "7 Habits of Highly Effective People" on Thursday. Mesa County Administrator Frank Whidden presents a budget proposal on Monday (Oct. 9) to the Board of County Commissioners. In the proposed budget, the general fund is balanced at $56,662,487 proposed revenue and $56,662,487 proposed expenditures. View the proposed budget PowerPoint presentation here, or to view the hearing go here. Stacy Beaugh and Karen Jefferson, co-chairs of the Riverfront Commission, brief the Mesa County Commissioners regarding the rebranding of the Riverfront project. Economic Assistance Team Meeting it is all about teammate support! Economic Assistance 4DX Jeopardy Winner Haydon Harrell and Division Director Michelle Trujillo. Sharon Tenace, Physical Education teacher at Thunder Mountain Elementary (TME) School, has taught road-safe skills to students since 2013. She said, "Thank you so much for implementing this crucial program into our schools. It saves lives!” The Safe Routes to School curriculum has reached over 2,400 students at TME alone. 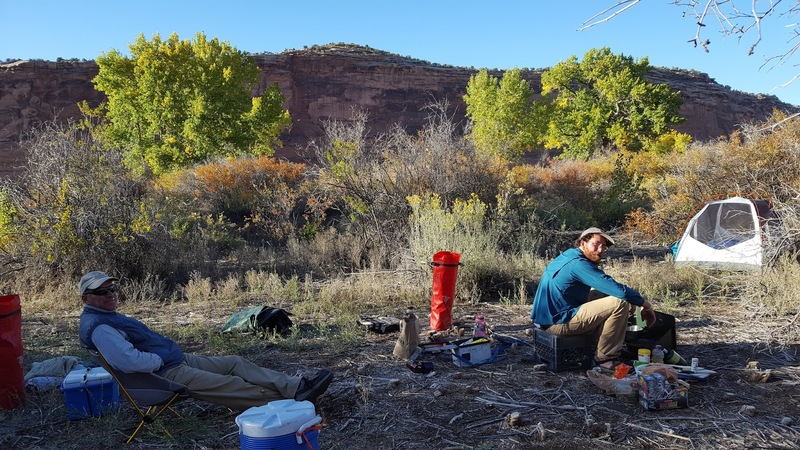 In 2014, Mesa County constructed a 1.25-mile sidewalk that connects TME to residences, dramatically increasing safe pedestrian and bicycle access. 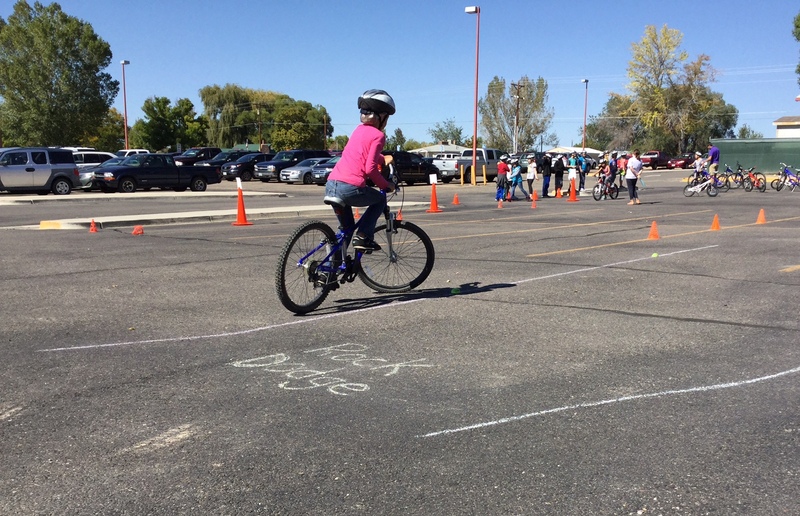 The goal of Mesa County's Safe Routes to School program is to enable more school-aged children to walk and bicycle to school more often. 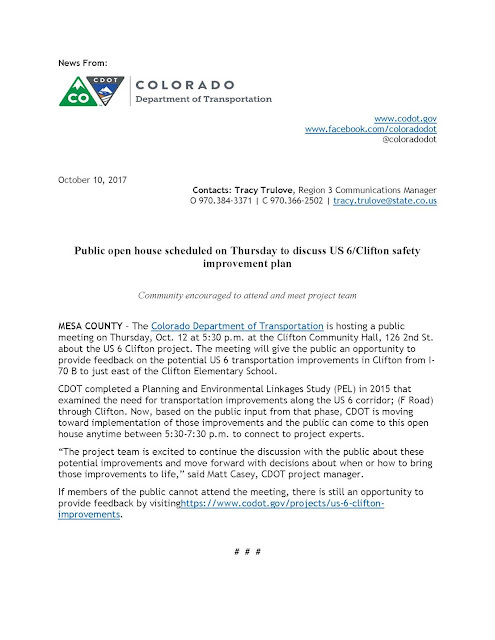 More information is available at https://rtpo.mesacounty.us/. 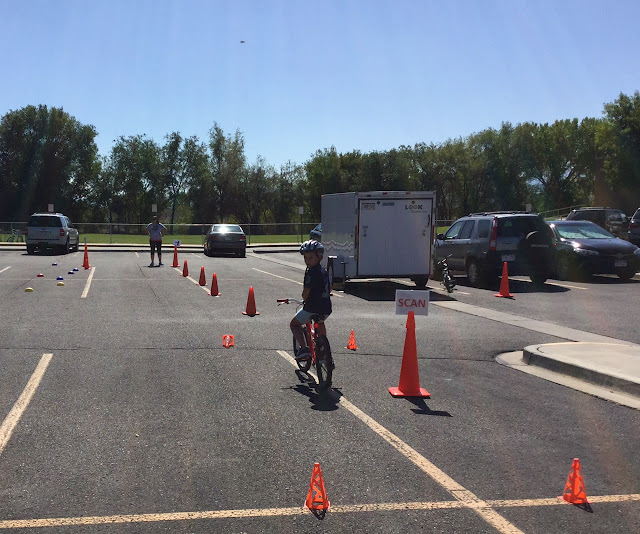 Some of the road-safe skills taught to students include scanning behind you for traffic, using hand signals to communicate your next move to drivers, and maintaining control while bicycling slowly. Consider chalking out a road-safe skills course at home and practicing with your children! Did you know that exercise wakes up your brain? Research has shown that kids who walk or wheel to school do better in school. That means you can boost your brain power by biking! October is Walk and Wheel to School Month in Mesa County. Give it a try! 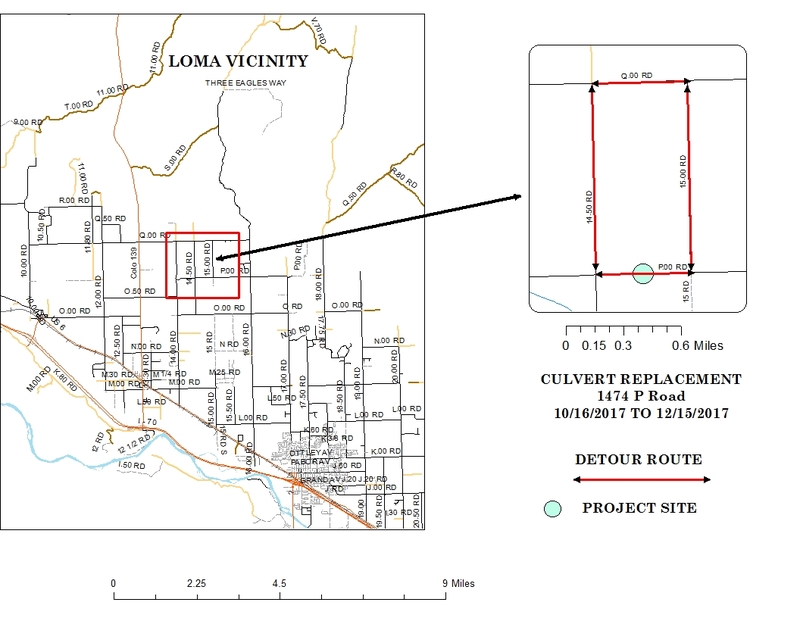 Mesa County Road and Bridge will start construction to replace the culvert at 1474 P Road (between 14 1/2 Road and 15 Road) in Loma Monday, Oct. 16. 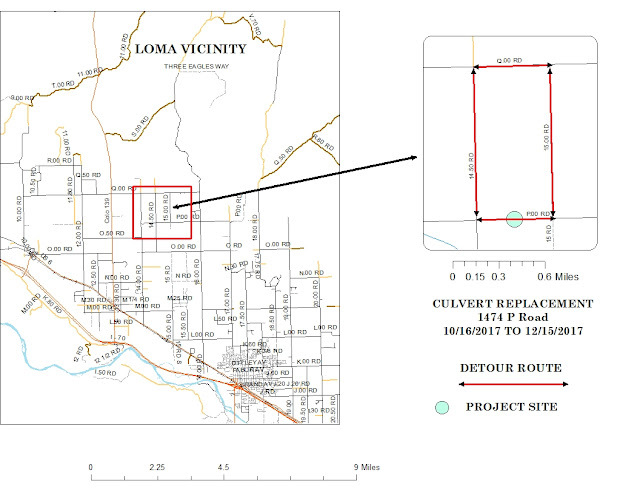 The road is expected to be closed from Oct. 16 to Dec. 15. 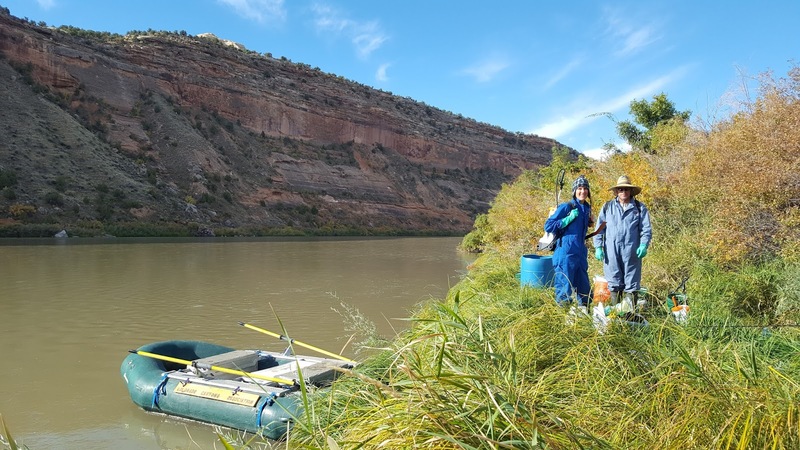 Mesa County Noxious Weed and Pest Management joined Colorado Canyons Association to treat Russian knapweed in a remote area along the Colorado River. Alan Barbee with Noxious Weed and Pest Management and Ryan McConnell with Colorado Canyons Association get ready for dinner after a day on the river and set up camp. Teresa Nees and Alan Barbee with Noxious Weed and Pest Management fill backpack sprayers with settled river water and fresh water hauled in on the boat to treat Russian knapweed. Alan Barbee with Noxious Weed and Pest Management sprays the highly invasive noxious weed Russian knapweed in an area near the Colorado River that had been disturbed by historical agriculture uses. 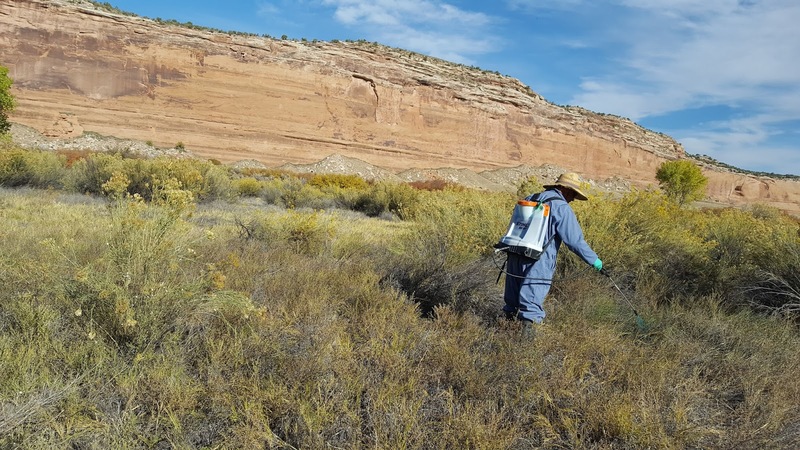 Hopefully, by reducing the number of non-native plants, native species can have better access to resources like sunlight, water, and nutrients. 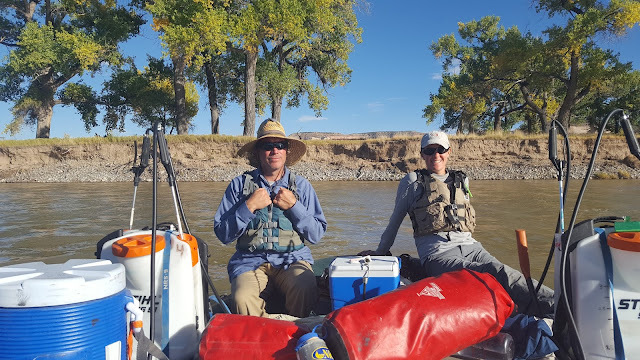 Alan Barbee and Teresa Nees with Noxious Weed and Pest Management enjoy their surroundings on the Ruby-Horsethief section of the Colorado River. 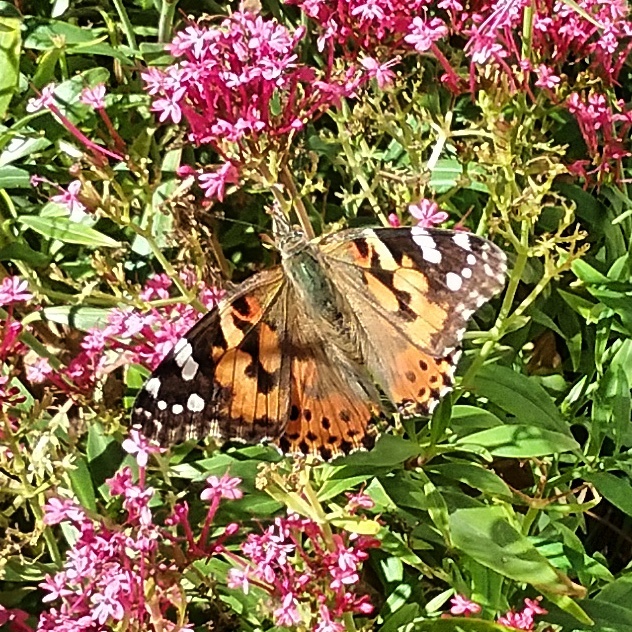 Kaye Simonson observed painted lady butterflies enjoying the valerian in the Old Courthouse's garden. Residents are invited to learn more about Mesa County’s proposed 2018 budget at three upcoming town hall meetings hosted by the Board of County Commissioners. Thursday, Nov. 9, 5:30-6:30 p.m., Fruita Community Center, 324 N. Coulson Ave. Hearings are typically held every Monday morning at 9 a.m. at 544 Rood Ave. The hearings include an unscheduled business portion of the agenda. Community members are welcome to provide feedback on the proposed 2018 budget at that time. For future Commissioner hearing agendas, go to https://goo.gl/Vfwg5N. Details on the budget outlook are available at www.mesacounty.us/finance/2018-budget.aspx. Final adoption of the budget will take place Monday, Dec. 4, at 9 a.m. in public hearing at 544 Rood Ave. Please note, the schedule is subject to change due to weather conditions. Mesa County Administrator Frank Whidden presented the proposed 2018 budget to the Mesa County Board of Commissioners this morning in public hearing. In the proposed budget, the general fund is balanced at $56,662,487 proposed revenue and $56,662,487 proposed expenditures. In November, county staff will finalize the budget, and in late November, the board will give staff final direction. Final adoption of the 2018 budget is planned for the Dec. 4 public hearing at 9:00 a.m.
Mesa County Commissioners honor and recognize Court Appointed Special Advocates (CASA) of Mesa County for their 20 years of dedication and invaluable service to the community. CASA is the only organization in the county that provides a voice in court for children and youth who have been abused. Mesa County Commissioners present a proclamation to CASA of Mesa County for their dedication to helping children in need. 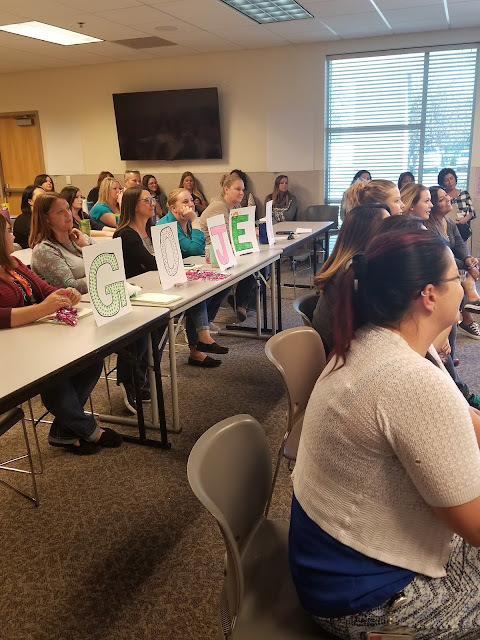 CASA has trained over 380 advocates and serves as the “voice” of more than 1,785 children who have found themselves, through no fault of their own, in the juvenile court system of Mesa County. 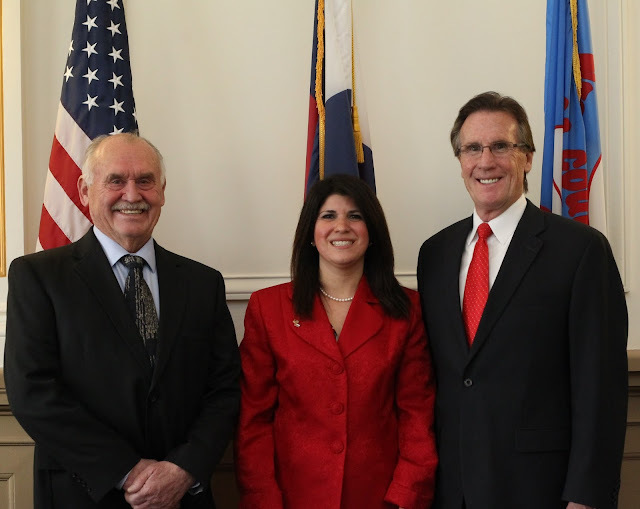 Mesa County Commissioners encourage residents to reach out to those who may be affected by child abuse in order to help ensure that all Mesa County children may live free of abuse, abandonment and neglect. To learn more about CASA or to become a volunteer, visit http://www.casamc.org.